Home of the Charlotte Motor Speedway, Concord, North Carolina is located in Cabarrus county with a subtropical climate zone with a wedding season from March through November. During those months the weather around the Concord, NC area has highs between 60 degrees and 90 degrees. Concord, NC has a large number of beautiful green outdoor areas that are ideal to host a wedding. 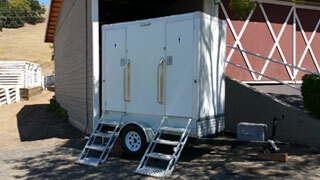 Our restrooms fit in anywhere from fairy tale, fancy, southern style to barn weddings. 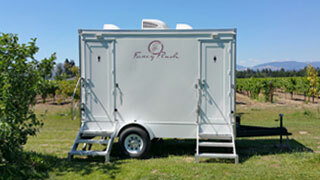 With the help of Fancy Flush you can now pick the perfect indoor or outdoor wedding venue regardless of if they have restrooms or not. 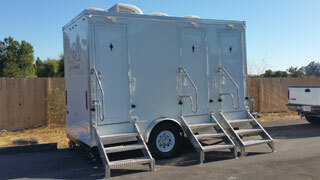 Amaze your guests with our VIP or LUX series portable restroom trailers which offer far more luxury than what you'd typically find at most venues.